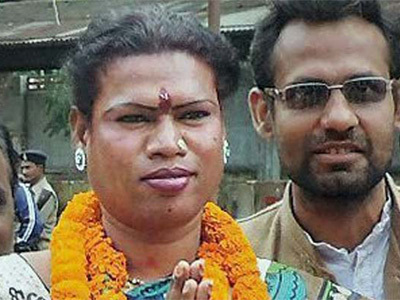 India has elected its first transgender Mayor, reports New Dehli Television. Madhu Kinnar, an Independent candidate, won the Mayoral election of the Raigarh Municipal Corporation by 4,537 votes, besting BJP's Mahaveer Guruji. "People have shown faith in me," Kinnar said after winning the election. "I consider this win as love and blessings of people for me. I'll put in my best efforts to accomplish their dreams." The-35-year-old trailblazer was also clear the victory was owed to an outpouring of public support, as she spent a conservative amount of funds on the campaign. "It was the public support that encouraged me to enter the poll fray for the first time and because of their support only, I emerged as the winner," Kinnar added. However, not everyone is celebrating Kinnar’s history-making win. "There was no Modi wave in Raigarh this time. People of Raigarh were fed up with the corruption of BJP, hence they voted for Madhu. It is not Madhu Kinnar's victory, but it's a loss of BJP," Raigarh district Congress (urban) president Narendra Negi said. Nevertheless, Kinnar’s opposition will not contest the outcome. "We accept the decision of people and we will review it," said BJP district president Rajesh Sharma. Kinnar’s election is an historic moment in the battle for global equality and the LGBT population of Raigarh, a city located roughly 300 miles west of the India-Bangladesh border where the population is primarily of Hindu faith. CORRECTION: An earlier version of this story misgendered Kinnar as "he," based on problematic reporting from the local source. The Advocate regrets this error and apologizes for the mistake, along with any harm felt as a result.